Copeland an attractive chalet with a choice of four glazing options. 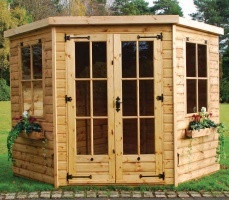 50x50mm tanalised floor joists, fully rebated doors and frame, fully glazed double doors, mortice lock and handle, 2 opening windows, 2 window boxes. Roof framing 70x28mm. Toughened glass to bottom door panes and diagonal bracing.